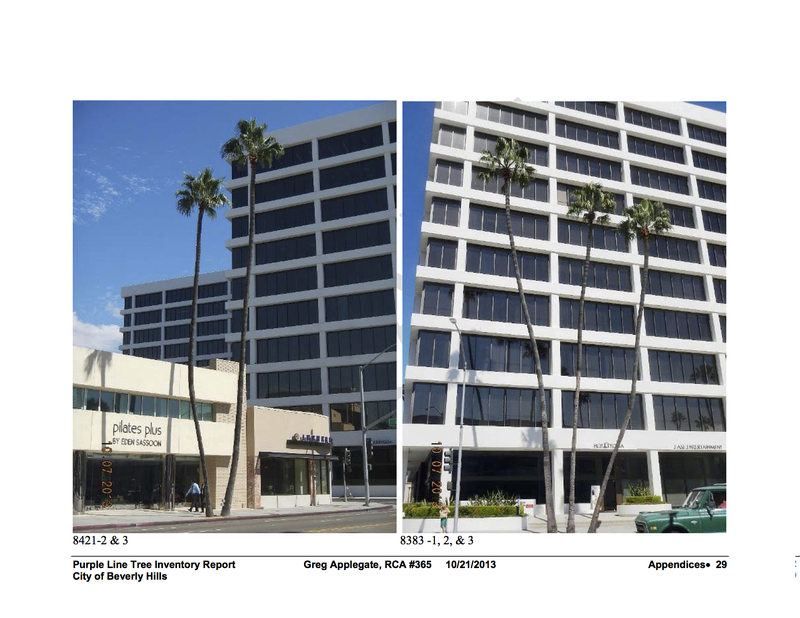 Mexican fan palms to be removed near the future Wilshire/La Cienega station in Beverly Hills. Plane trees in the city of Los Angeles to be removed for subway construction. As we move deeper into the era of construction for Measure R projects, we’re also going to be writing more about the inevitable work impacts of building transit and road projects. And thus today’s news: about 135 trees — about 34 in Beverly Hills and 101 in the city of Los Angeles — will eventually have to be removed and later replaced along Wilshire Boulevard to accommodate work on the first phase of the Purple Line Extension subway. Most of the trees to be removed are in the area where three new stations will be excavated: Wilshire and La Brea, Wilshire and Fairfax and Wilshire and La Cienega. Metro says it will plant two trees for every one that is removed. The bulk of the tree removals are still about a year away and will be managed by the future contractor. However, in the next month or so, Metro is seeking to remove two Mexican fan palms from the median of Wilshire just east of Detroit (near the Wilshire/La Brea station site) for pre-construction work — specifically, fiber optic utility relocation. The agency has also submitted draft Master Tree Removal Plans to both Beverly Hills and Los Angeles and will work with both cities toward agreement on a final plan. Of the trees to be removed, many are not in good shape and Metro officials say likely would not survive transplanting. None of the trees are protected, historically significant or belong to threatened species, although some of the Mexican fan palms to be removed are taller than 50 feet (Mexican Fan palms are a very common tree planted in cities in warm weather locales in the U.S.). Crape myrtle trees and London plane trees are other common species to be removed. Perhaps the most popular tree to be removed are five jacarandas in the city of Los Angeles. The bulk of the tree removals are still a ways away and will begin at La Brea in 2015 and then proceed in stages. However, Metro is currently seeking to remove two Mexican fan palms from the median of Wilshire just east of Detroit in order for advance utility relocation work to be done. The agency has also submitted draft Master Tree Removal Plans to both Beverly Hills and Los Angeles and will work with both cities toward agreement on a final plan. Obviously no one likes to see urban trees lost. Urban greenery is important, particularly in a region so outfitted with concrete. If someone chopped down a tree in front of your house or apartment, you’d probably notice. That said, a little perspective here: there is an estimated 10 million trees in the city of Los Angeles alone, meaning the trees lost for this and other projects are overall a very small percentage of the trees in our region. All the species to be removed are also fairly common species in our urban forest. The end result: Metro officials say they will be replanting twice as many trees in the area and that the area will have an improved, and beautified, urban landscape when construction is complete and the street is fully restored. Below a pair of reports prepared by a contractor hired by Metro to inventory inventory the trees likely to be removed. The top report is for trees in Beverly Hills, the bottom for the trees in Los Angeles. Isn’t it possible for a mature tree to be temporarily removed and replanted elsewhere, then returned to be replanted on Wilshire at the appropriate time? Assuming there is a significant added expense for such an undertaking, perhaps the community could select a limited number of trees slated to be cut down to instead be preserved and replanted in this manner. While it’s nice that Metro will replant the cut-down trees on a 2:1 ratio, It would be extra-nice to avoid large swaths of exclusively new-growth trees. Scattering in the replanting of some of the preserved trees could give these areas a more “natural” look. Please see the reports. I’m told it is possible, but it is very expensive to find somewhere to transplant the trees with no guarantees that they will survive, whereas it’s relatively inexpensive to purchase newer, younger trees — and that some species, in particular, the Mexican fan palms, grow relatively quickly. The removal and replacement by government agencies has never been that successful. In recent years Fichus Trees have been the target. Described as growing like weeds instead of able to thieve in a urban environment successfully. The City of West Hollywood replaced all of the fichus trees along Santa Monica Bl. except adjacent to the old movie studio about fourteen years ago. We were promised a beautiful canopy over the sidewalks. Instead we have a major therefore lined with sickly looking trees that provide no shade and most have been replaced more than once. The only trees that provide the promised shade are the fichus that were saved. Although it would be more expensive, the trees that must be removed should be minimal, not just because they may be somewhat in the way, and replanted in our parks or along the boulevard where trees are scarce. Due to the added expense, I’d recommend only select trees be held for replanting, not all of them. As for ficus (I assume that’s the species mike dunn was referencing), they do provide shade, but at the cost of destroying sidewalks and even adjacent roadways. There are other trees that can provide shade. Why not offer the trees for free to homeowners that would replant them (no guarantee they won’t die, of course) or even to someone that could resell them? What’s the difference in cost between simply cutting down a tree and trying to preserve the rootball? Trees however, are also the main cause of uprooted sidewalks and expensive sidewalk repairs that need to be done that is currently backlogged for over sixty years due to lack of funding. Over grown trees cause pedestrians and many home owners, especially the elderly and the disabled to feel that they are stuck at home because they cannot go over badly damaged sidewalks in their pushcarts or wheelchairs. Something else to think about whether being a city of tree huggers is actually good for urban society and for taxpayers in the long run. No trees, no clean air. They do have a vital use. In West Hollywood where the fichus trees remain the sidewalks are still in good condition and there is shade even though in my opinion the city over prunes them. On the other hand the replacement trees often look as if they are almost dead. Fichus trees are well suited for our urban environment whereas many trendy trees are not. It’s all about root control. Chop all of them down. No one cares. Many of our sidewalks are in bad shape because of overgrown trees anyway. You want to see trees, go visit Angeles National Forest. Palms are not “trees”, they are a grass. And they are not native to the region. 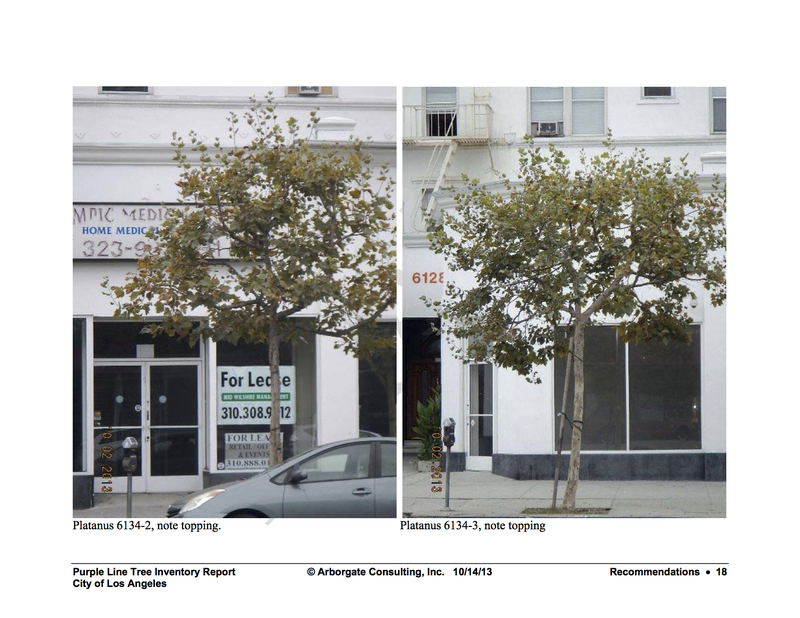 This report doesn’t address the newly planted trees in front of the BRE development at Wilshire/La Brea. I assume these will have to go, too. The report seems to ‘put down’ many of the trees for very basic reasons (too many limbs/trunks, other fixable stuff, ‘planted in turf’?? ), and only suggests a few of the trees are in good shape and should be re-located. The trees in the median directly in front of LACMA are mature and should be saved (this is where most of the palms shown in the report to be re-located are planted), so it might just be easier to leave this median as-is.